This club is a bit pricey, but for good reason. Owning this driver is like owning five or six different drivers, because it has TaylorMade's Flight Control Technology (FCT). FCT will give you up to 75 yards of right-left variance, 3 degrees of variance in launch angle, and a 1,500-rpm difference in spin. Plus, you have movable weights that help you refine your direction. Bottom line is: If you are having trouble hitting a slice (like a lot of us), simply set the FCT to closed and put some extra weight on the heel. You will start ripping it down the middle. The best part is once you start to improve, you can always go back to a neutral position, or even open if you are hooking the ball. The face is a huge, forgiving 460cc, and the Supertri has a lighter crown and sole than the old R9. The forgiving face is also very deep and has an aerodynamic shape. The face has a low center of gravity, and the aerodynamics obviously cut down on drag, giving you a higher clubhead speed. 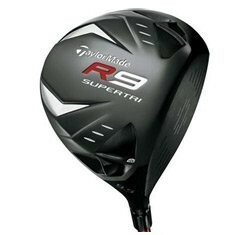 I would recommend this driver for all levels of golfer. If you would like to look at TaylorMade's most aerodynamic driver, check out the TaylorMade Burner SuperFast Driver. It is lighter, longer, and more aerodynamic then this Supertri, but it doesn't have the cool FCT.